This is the 55th volume in Naïve’s Vivaldi Edition, and the 18th complete opera in this series. It is a total delight. The work is a melodramma eroico pastorale and tells of Dorilla, daughter of Admeto, the king of Thessaly. She is in love with a shepherd, Elmiro, and he with her, while yet another shepherd, Nomio, is also in love with her. A nymph, Eudamia, pursues Nomio, while a third shepherd, Filindo, pursues Eudamia. The idyllic Vale of Tempe is menaced by the dragon Python and the local oracle decrees that Dorilla must be sacrificed to appease it. Nomio steps forward and slays the Python, later demanding Dorilla’s hand in marriage as a reward, to which the king agrees. She steadfastly maintains her love for Elmiro who is condemned by the king, and Dorilla declares she wishes to die with him. At this point Nomio reveals himself to be the god Apollo; he realizes he has been defeated by the force of true love and commands that Dorilla marry Elmiro, and Eudamia marry Filindo. The pastoral setting is established from the start when orchestra and chorus perform measures taken from Vivaldi’s own Summer concerto from his Four Seasons, published shortly before this opera was premiered. There is a great variety of expression in what follows, especially with the attack of the Python, and hunting scenes heighten the action at crucial points. Apollo’s startling self-revelation is rather abrupt (I wouldn’t have minded the interjection of a fanfare and even a drum roll), as is the happy denoument (a common feature of such works). Nineteen arias are sung, interspersed with expressive recitatives, pungent choruses, and a shepherds' dance. If there is a flaw it is the surfeit of similar voices (four mezzo-sopranos and one alto, with just one baritone) in a work featuring four male and two female characters. Paying close attention to the libretto helps sort things out. Contrary to expectations, the lightest voice, that of Serena Malfi, is handed a male role, that of the ardent shepherd, Elmiro. Rich-voiced alto Sonia Prina stands out as the calculating Eudamia. The sturdy-voiced king, Christian Senn, opens with an aria similar to that for Polyphemus in Handel’s Acis and Galatea. Conductor, chorus and orchestra are from the Italian section of Switzerland; their well-honed Vivaldian style is superbly energetic and lucid. In the manuscript that survives there are numbers by other composers (this was not unusual in its day): three by Adolph Hasse, two by Geminiano Giacomelli, and one each by Leonardo Leo and Domenico Sarri. The resulting pasticcio poses no problems. Each aria expresses its message vividly and none wears out its welcome. There are minor errors in the booklet. The nymph Eudamia is referred to as a princess (when the only princess is Dorilla); plus a few cuing numbers are missing. 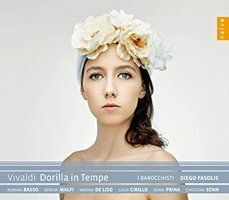 I see that this opera will be performed in Venice in 2019 conducted by Diego Fasolis with at least one member of this recording’s cast, Lucia Cirillo, in the title role. The right production would make this musically vibrant work a must-see.